Any audiophile and music professional will admit to the fact that the heaviest of bass music (EDM, hip hop) sounds the best in clubs and concert venues. After all, the speaker quality is unparalleled in these venues. But what if you want to recreate this sound experience at home? That is where the best headphones for bass come into play. Whether you want skull rattling cannons, accurate and clear hi-fi headphones, or responsive bassy headphones, we have something for you below. The 7 headphones we will list below allow for deep and strong bass quality, as well as superior comfort, minimal distortion, and responses at lower frequencies. So read on for some enticing information. The best bass headphone is without a doubt the V-MODA Crossfade M-100. This exceptionally portable headphone promises deep pulsing bass without rattle, accompanied by higher-grader treble and mid tones. The response frequency in particular is beyond reproach, with a range of 5Hz-30 KHz. What this means for you is powerful and muscular sound throughout the frequency range, without fear of shaking as witnessed in other headphones. In addition, the 50mm duel diaphragm guarantees that the bleeding of mids and highs does not occur, leaving you with crisp and booming bass, vibrant mids, and prolonged highs. And if you are the type of person who enjoys cranking up the bass to spectacular volumes, the 103dB sensitivity will ensure that your speakers remain intact. One of the few complaints involving the M-100 revolves around its ability to shut out noise; however you should be aware of the fact that these noise isolating headphones effectively keep your music in and the noises out. There is a lot to say about the MDR-1R, and a majority of it is overwhelmingly positive. Sony has scored again with these bass headphones, which boast of a startling 105dB sensitivity and 40Hz-80KHz of frequency response. What this means for you is that you can now receive solid bass, pronounced highs, assertive mids and deep lows, which ensures that your bass listening is rich and prominent. When this is combined with the 40mm liquid crystal diaphragm, you have headphones that will provide fantastic bass across an extended frequency range. Audiophiles will also be excited by its lovely design, sturdy build, impressive bass extension, and superior low-bass separation. However, the on-ear design of the MDR-1R prevents optimum noise isolation, but the closed styling and acoustic seals build on the shortcomings of this design. You can now experience amazing deep low bass with Sony. You may be asking why the Momentum makes it on the list of best headphones for bass. Here are a few reasons. To begin with, this high sensitivity headphone (110dB) is elegant and sophisticated in its appearance, and this is augmented by its fantastic bass reproduction. Though Sennheiser has opted to take a more conservative approach with the reproduction, the bass remains precise and clear- unlike the aggressive tones found in other headphones. If you enjoy strong thumping and rattling in your bass, then this is not the option for you. In addition, the Momentum boasts of exemplary noise isolation, powerful sounds signatures, vivid mids and highs, and rich responses. And there is also the comfort factor associated with these bass headphones, with a top grade leather headband and ear pads ensuring that clarity is at its highest at all times. Before we begin, it is important to note that these bass headphones have a burn time of 55 hours, so do not be disappointed by the bass you first hear. This highly responsive and sensitive set of headphones ensure that bass reproduction is strong, true, deep, pumping and incredibly sweet; with crisp and clear lows. However, the beauty of the Beyrdynamic lies with its noise variable reduction slider, which allows you to regulate your bass output using a four-stage operation. This multi-layer delivery of bass ensures that your music is strong and customized to your preference. You should be aware that all accessories are sold independently from the headphones. Sony scores highly again with the MDR-X10; a sure way of experiencing hard-hitting bass. Furthermore, the focus on sound level isolation via the acoustic seal design allows for strong bass reproduction and ultra extended bass beats. When this feature works in conjunction with the 50mm driver units and neodymium magnets, we get a responsive and forceful frequency of 3Hz-28 KHz, which is perfect for the most popular of music genres. Additionally we have a 3.5mm jack found on the MDR-X10, which gives you the opportunity to connect with secondary devices e.g. Android devices and Apple devices. The bass emanating from the Denon AH-D600 can only be described as being of rib pounding, head rattling and body slamming quality. This serious and clear sound quality works to counteract the lack of noise cancellation abilities, by ensuring bass reproduction is respectable at all times. 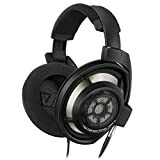 The comfortable bass headphones are also renowned for their extensive 5Hz-45 KHz frequency response, which allow you to experience the lowest of lows and the highest of highs- hence the head rattling feeling. If you are looking for headphones that will provide quality sound at high volumes, then this is the set for you. Last but not least we have the amazing Monster Inspiration. These headphones are perfect for every audiophile- amateur and professional. So, why would you consider these high sensitivity headphones? Firstly, these headphones come in 2 models offering passive and active noise reduction. But there is one thing both models have in common; they offer superior, deep and clear bass sound, which does not rattle nor degrade the treble. What this means for you is that you can now listen to your bass without distortion, regardless of the genre of music or volume of your headphones. Wearing these headphones is exceptionally comfortable, and using them is equally intuitive; what more can you ask for? As you can now determine, the aforementioned headphones are the best headphones for bass on the market. 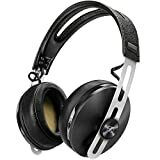 Alongside the Beats Executive, Yamaha Pro 500 and JVC HA-SZ2000 which we have not reviewed, these 7 headphones promise clear, crisp and strong sound quality dedicated to your bass listening. So select one and begin your listening today!